Since I'm not going anywhere right away, I'm thinking about what the unsolved issues are for me when I do get out. 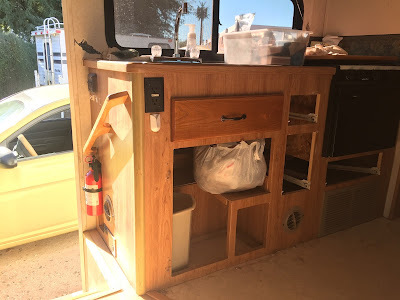 I'm almost done with refinishing the doors and drawer fronts in the kitchen area, and it does make a nice cosmetic difference. I've got the little Verizon device which gives me voice communication when I don't have ATT. I'm working on the tire repair kit. I do need some leveling blocks and chocks. I'm pretty sure I want/need a new backup camera rig. The Beast came with a hard-wired rear view camera which is mounted down low. I'm pretty sure the intent was to facilitate hooking up a tow vehicle. It's not real useful, particularly since its view is blocked by the rear cargo rack or (when it's mounted) the bike rack. Mostly what I want is something which will give me better visibility in the passenger-side blind spot, so I can merge right with greater confidence. It'd also be great to see the rear racks so I don't back up into something when I'm maneuvering in close quarters. An RV is like a boat, eh? A hole in there water you throw money into. I fully expect to get out in the rig this winter; I mentioned that I'm thinking of going over to Quartzite before the huge crowds around January events over there. I'm thinking that I may spend more time on the road next summer than I did this year. If I have a plan (firm as Jello, as Nina from the Wheeling It blog would say), it's to focus on New Mexico. It's close enough to home that I can get to interesting places without spending days and days getting there; it has some really cool cities like Santa Fe and Albuquerque, and my friends the Reillys are in up in White Rock near Los Alamos. This represents a significant cost, and like any insurance, it's hoped that it'd never be used. I already have the Viair 88P pump. The bottle jack makes sense. 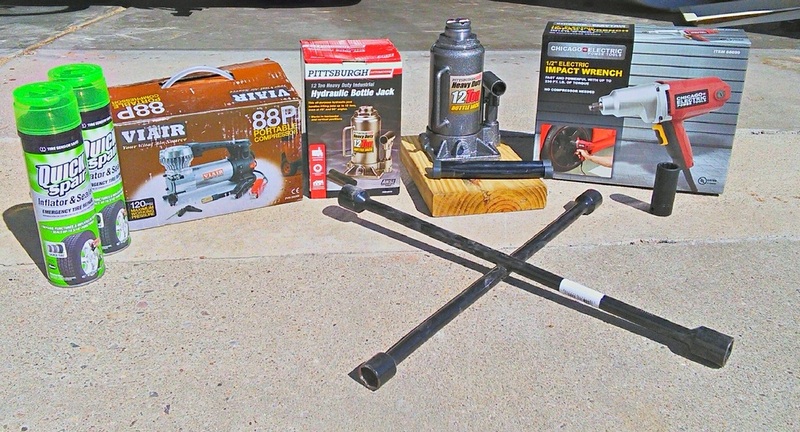 The electric impact wrench is probably the biggest expense, and the biggest "if." I'm thinking of approaching this in stages: get the jack, see how it works with the road clearances in my rig, see if I can get the lug nuts off my wheels without power tools. In general, it seems to make sense to get over my newbie tire-changing anxieties in a nice safe storage lot in Tucson than out in someplace wild and wonderful. I'll keep y'all posted. The trip to Boulder via Southwest and Fox rental car was a success. Getting to Boulder from the airport wasn't much fun; Google Maps got me royally lost in an industrial area, but once I got on Rte 36 all was well. Next RV trip: I thinking about a few days over in the Quartzite area just to see what it's like before the hordes descend in January. It's one of the few nearby areas with warm (-ish) temps this time of year. Now here's the problem. It's not entirely apparent in the picture, but the finish on the drawer is much glossier and a bit darker than the rest of the "cabinet." I put that in quotes because it's some kind of faux wood-finish stuff, which is pretty banged up after 16 years of use. I have the other elements -- two drawers, two cabinet doors -- all stripped and ready to be finished. Plan A: make them like the one drawer I did. Plan B: Get some new stain, re-strip the one I already did, and make them not-so-glossy and closer to the background finish. Plan C: re-do them all in a much darker finish, not trying for a match at all. Good thing I'm in no hurry, and enjoy this kind of thing. Hmmm.. I suppose I could rip the whole thing out and build new cabinets out of real wood. Nah! Headed for Boulder CO to see family before the weather and holiday travel crowds make it less pleasant.